Update on Black River Falls Bald Eagle — Raptor Education Group, Inc. The young bald eagle admitted from Black River Falls yesterday is improving. She is emaciated, starving and has the viral disease, Avian Pox (AP). (similar to our chicken pox) The pox lesions located on her face and eyelids compromised her vision which means she was unable to hunt resulting in emaciation or near starvation. As a note, some folks might find the photos I attached, and description cringe worthy. Please use your own judgement if you want to continue. Please understand she is going to get better. Avian pox is not contagious to humans. It is contagious to other birds and is carried by mosquitoes. Our patient has had the pox, for some time. It has run its course as viruses do. She has the dry version of avian pox and her lesions are no longer active. Avian pox is currently not her most serious problem. She could have recovered in the wild, had starvation not been a factor. Starvation is what we are addressing first. We are isolating her from other eagles, just to be extra careful. The fact that pox affected our young patients face and eyelids, meant she was unable to see well. She could not close her eyes in the normal way. That remains a problem for her. Fortunately, eagles have an inner eyelid called a nictitating membrane which is working well, and has saved her sight. We will continue to work on softening the scar tissue on the actual eyelid and better evaluate her vision during the next few weeks. Avian Pox is a viral disease. There is no medication or treatment for it other than antibiotics to treat secondary infection and supportive care. 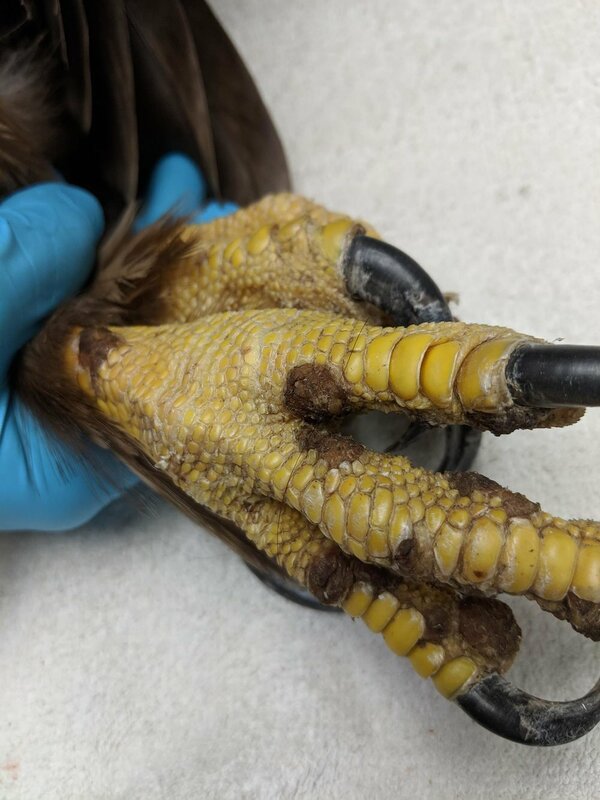 While we at REGI have seen avian pox in other species, we have never had a case in a bald eagle before. Pox infected birds in the wild often die of starvation as our patient would have, had she not been found and rescued. This young eagle had many heroes that helped her during her last days difficult days in the wild and transportation yesterday. She was found standing on a roadside not moving. She had been in that same place for a few days. We are grateful to the Jesse family, Jared, Connie, Alex and Michael of Black River Falls that made calls and got the eagle the help she needed. They went above and beyond to rescue her late at night and well after dark. Connie Jesse works for the Black River Falls School District and send out emails to her colleagues to find a transporter to get the eagle part way to REGI. That is where Brad Myers stepped in and stepped up and with his Black River Falls High School Nexus class and made the road trip to transport the eagle, which was in critical condition, to Marathon City where REGI staff picked her up, treated to stabilize her on site and then continued to Antigo. The Nexus class was able to experience the entire process and get some ideas about the future careers. The Nexus students that participated were; Trent Stubrud, Treyton Laufenberg, Amanti Lucero, Brent Gilbertson and Zackary Diggin. Thanks everyone. This little lady eagle has a future now and came so close to not having that opportunity. 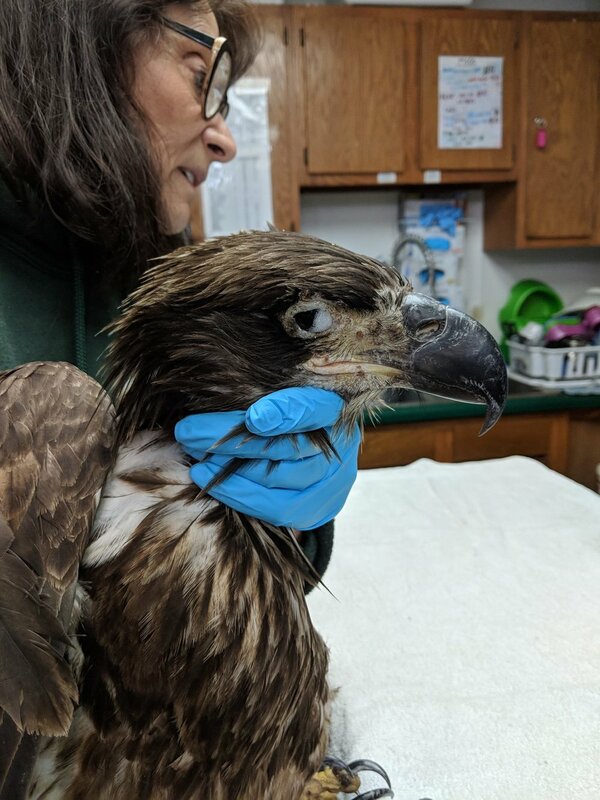 The River Falls High School Nexus Program and Brad Myers transported the eagle to Marathon City where she was treated and then transported the remainder of the way to REGI. Thanks everyone. Getting a good look at the eagle after they transported her. Treatment has begun to soften the scars on the eyelids and treat the eye so moisture is better retained. Scars from avian pox are on the young eagles face and eyelids. 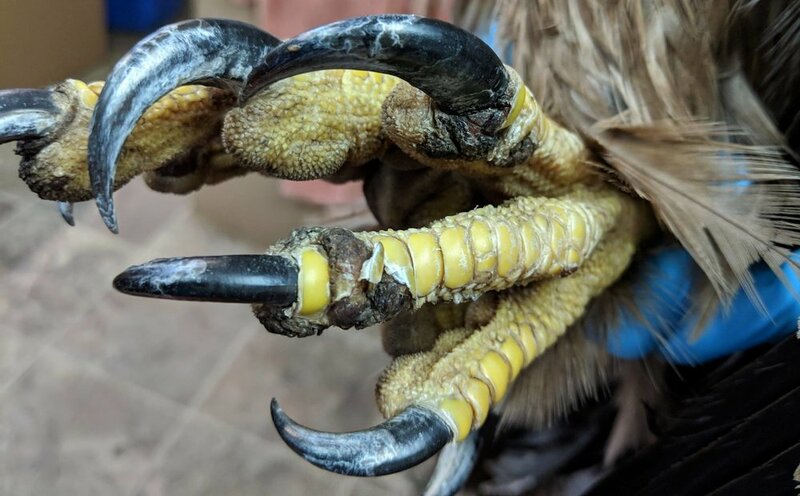 They young eagle has the dry or cutaneous type of avian pox. It is not contagious to humans however is contagious in the infectious stage to other birds. The white on the inner aspect of the eye is not a pox it is result of the birds eye trying to maintain its moisture. Pox can show up on any parts of the body that do not have feathers. The young eagle has some pox on her feet as well.